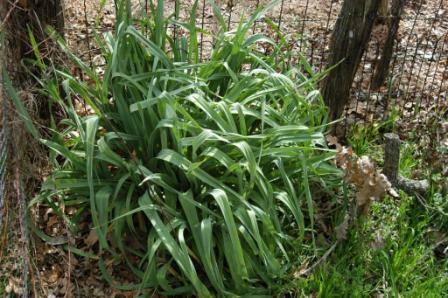 Garlic to chase away Mosquitoes For site use: Spray garlic tea over the entire proble area and for even more control broadcast dry minced garlic at 2 - 5 lbs per 1000 sq ft.
ANSWER: Neem products traditionally have been used to help control this pest, but I also recommend garlic. 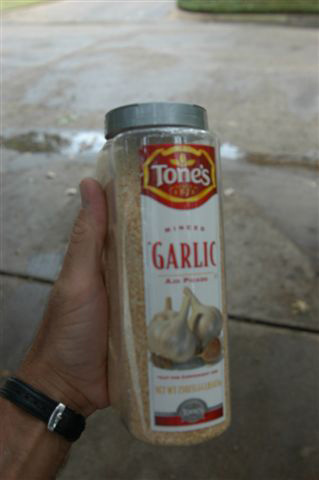 Apply dry, granulated garlic in the plant's root zone at a rate of 2 to 5 pounds per 1,000 square feet, and spray the foliage with a liquid garlic product. 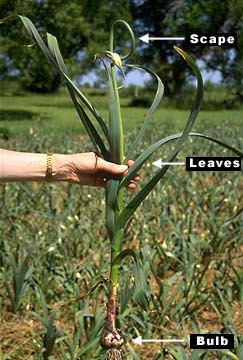 ANSWER: If you wait until the leaves are dead, much of the energy, food value and taste in the bulbs will be used up. Allium sativum L. Commonly known as garlic, is a species in the onion family Alliaceae. Its close relatives include the onion, shallot, and leek. A 'head' of garlic, the most commonly used plant part, comprises numerous discrete 'cloves'. The leaves and stems are sometimes eaten, particularly while immature and tender. Edible greens and cloves. Garlic is well known as a very important food and medicinal herb, but it can be used as a good looking landscape perennial. The flower heads can be cut, hung upside down and dried to be used in indoor arrangements. An organic insect and disease control material made from the juice of garlic and hot peppers such as jalapeno, habanero, or cayenne. This is one of the few preventative controls that I recommend. However, its use should be limited because it will kill small beneficial insects. It is effective for both ornamental and food crops. To make garlic/pepper tea, liquefy 2 bulbs of garlic and 2 hot peppers in a blender 1/2 to 2/3 full of water. Strain the solids and add enough water to the garlic/pepper juice to make 1 gallon of concentrate. 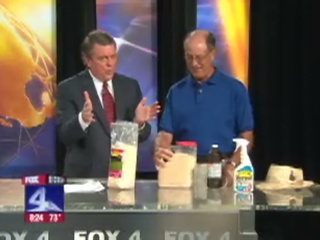 Use 1/4 cup of concentrate per gallon of spray. To make garlic tea, simply omit the pepper and add another bulb of garlic. Add two tablespoons of molasses for more control. Planting Dates: Fall is best, but can be planted in the spring. In Dallas, I plant between October 1-October 15. Harvest Time: Varies, but should be done as the leaves start to turn brown. It’s bad advice to wait until the tops turn brown and fall over. At that point the bulbs will be over-mature and often split open like a flower. At this point, food value will begin to diminish. Garlic can’t be stored in the ground as onions can. Watering too long or too wet soil will cause bulbs to rot. Days to harvest range from 90 to 180. Growth Habits: Considerable variance in the various subspecies. Some have flower heads and some don’t. I think garlic is a beautiful plant and useful in the landscape garden, herb garden, and vegetable garden. Culture: Easy to grow in healthy soil. Good drainage is essential so raised beds, rows or hills are best. Fertilize at least twice with an organic fertilizer and spray at least monthly with Garrett Juice. Using (hopefully, organically grown) large bulbs, separate into individual cloves and plant them in prepared soil, 1 inch deep in clay soil, 2 inches deep in sandy soil. Point up is the best but, I’m usually going too fast and lay the cloves on their sides. Soaking the cloves in seaweed and water before planting is helpful. Putting Actinovate and cornmeal in the soil at planting also helps, especially if your garden soil is not alive and healthy yet. Water the cloves in and then cover with about 1-1/2 inch compost. The garlic sprouts will emerge within a few weeks and the plants will continue to grow into the winter. Don’t worry, they won’t freeze unless we have an ’83-type winter again. A little browning of the leaf tips is normal. On nights of hard freeze, you can cover the planting with floating row cover. Increase the thickness of the mulch as the plants grow to maintain perfect soil conditions. Every garden should have plants of garlic. It’s easy to grow and one of the most useful plants in the world. Troubles and Solutions: Few problems if any, when planted in healthy soil and at the right time of the year. Harvest and Storage: Garlic should be cured slowly indoors, in low humidity, not in wind rows in the garden. Dig the bulbs when the leaves begin to turn brown in the summer and store in a cool, dry place. In order to avoid diseases, bruising and other causes of spoilage, the bulb wrappers should cover the cloves. A good rule of thumb is to harvest the bulbs when the top has at least 5 leaves. Each leaf represents a bulb wrapper. Each brown leaf means a dead or decaying bulb wrapper. When wrappers are damaged or gone, the garlic cloves are not necessarily ruined, but they are possibly injured and in danger of spoilage. Do now wash the bulbs, and do not trim off the roots and tops. Notes: For larger bulbs, cut the flowering stems as they emerge from the foliage. Giant garlic or elephant garlic is actually a leek and has a milder flavor than true garlic. Chew fresh leaves of parsley or sweet basil to cure "garlic breath." The high chlorophyll content helps to neutralize the garlic odor. Garlic tea is an excellent insect control. Using garlic as an ornamental plant is often overlooked. I plant garlic in the perennial beds, the herb garden, and even in pots because I like the way it looks. The foliage is dark green and the flowers are dramatic. Just don’t let the flower heads mature and scatter or you will have garlic everywhere! Garlic mustard is a very common invasive throughout the mid-atlantic. Broad-leafed, with small white flowers on thin spikes. Seed bank lasts 10 years so needs to be pulled each year including the non-flowering first year. And yes, it's edible.